With iOS 10 released this week, it's easy to get excited and want to update your device straight away, however there are a few things you may want to consider first. iOS 10 update is only available for newer devices, the oldest iPhone supported is iPhone 5 and you'll also be able to update your 4th generation iPad, iPad mini 2 and newer. In case of the iPod Touch, only 5th and 6th generation devices are able to upgrade to iOS 10. With failed updates widely reported on the first day of iOS 10 release, make sure that your iPod Touch, iPhone and iPad content is backed up to your computer before your update your device. Note that if you normally backup your device on iCloud, you won't be able to roll the update back to iOS 9.3.5 should you need to do so. You will find both iTunes and our TouchCopy software helpful in backing up your iOS device on your computer. You can find detailed instructions on how to backup your iOS device using iTunes on Apple's website here. Note that iTunes backup does not contain any iTunes synced content, such as your music, playlist, photos added by iTunes, PDFs downloaded directly to iBooks, etc. This content will need to be backed up using software like TouchCopy. TouchCopy will backup your entire iPod, iPhone and iPad content to your PC or Mac, including your music, playlists, videos, photos, messages, contacts, calendars, iBooks and more. Here is the step-by-step guide on how to backup your iPhone, iPod and iPad using TouchCopy. Run TouchCopy and connect your iPod, iPhone or iPad to your PC or Mac. Connect your device to your Mac or PC using a USB cable and wait for TouchCopy to detect and read it. Click on the "Backup All" icon in TouchCopy. TouchCopy will save all your Music, Playlists and Video from your iPod, iPhone or iPad to your computer or iTunes. 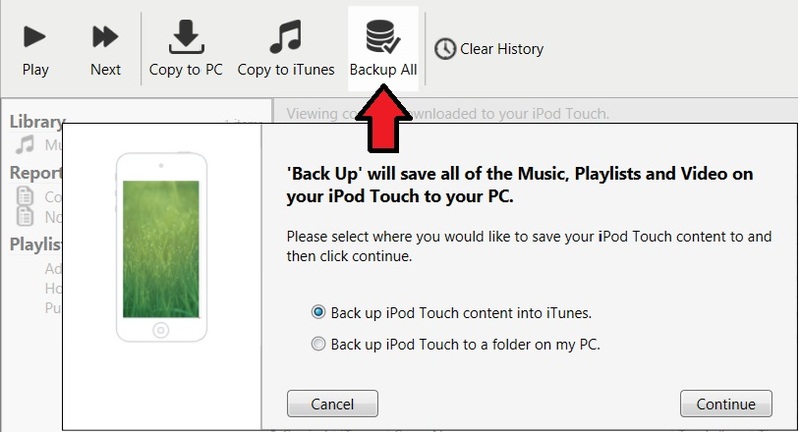 To Backup the rest of your content, select the item you wish to backup in TouchCopy and choose if you wish to Copy your content to your computer or iTunes. Click the Messages icon to backup your iPhone SMS, WhatsApp and iMessage conversations. Click the Photos icon to view and copy your iPhone and iPad photos. Click the Contacts icon to backup iPhone contacts. Click the Calendars icon to save your iPhone, iPad and iPod calendars. Click the Notes icon to save your iPhone, iPad and iPod notes. Click the Books icon to transfer books downloaded using Apple’s iBooks App from your iOS device straight into iTunes. Click the Internet icon to export your Internet Bookmarks and Browsing History from your iOS device. Click the Call logs icon to View and backup your iPhone call log history to your computer.